I've had it. Playing sports usually means I get to eat out with the team afterwards. But with certain groups, either nobody wants to go out or it is the same ol' restaurant over and over again (like Alleluia on Saturday nights). Thus, I decided to eat late night all by my lonesome. But wait, I wasn't planning on being that creepy guy at 2:00am taking pictures of his congee in the corner. No way! I would only do such a thing during daylight hours... 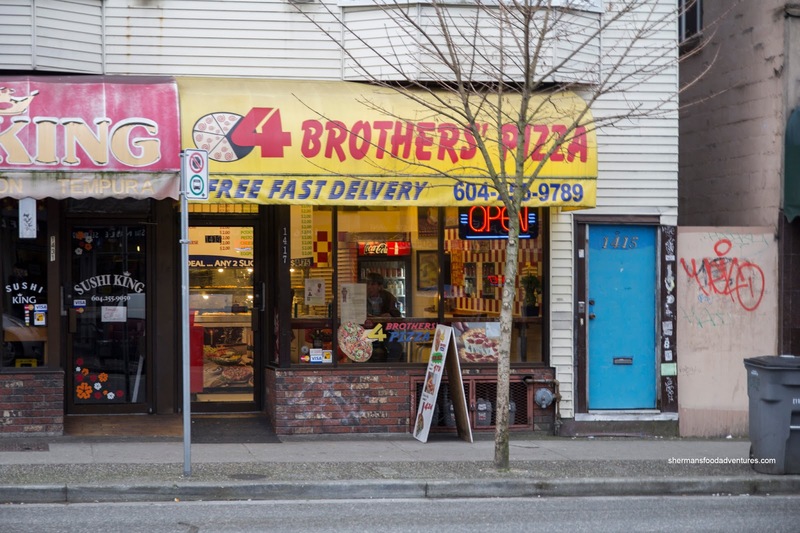 Therefore, I decided to head to 4 Brother's Pizza for some slices instead. I went for 3 for variety reasons and honestly, I could eat that much. Of course I had to get the Beef and Blue Cheese as a comparison to Uncle Fatih's and it was naturally different. 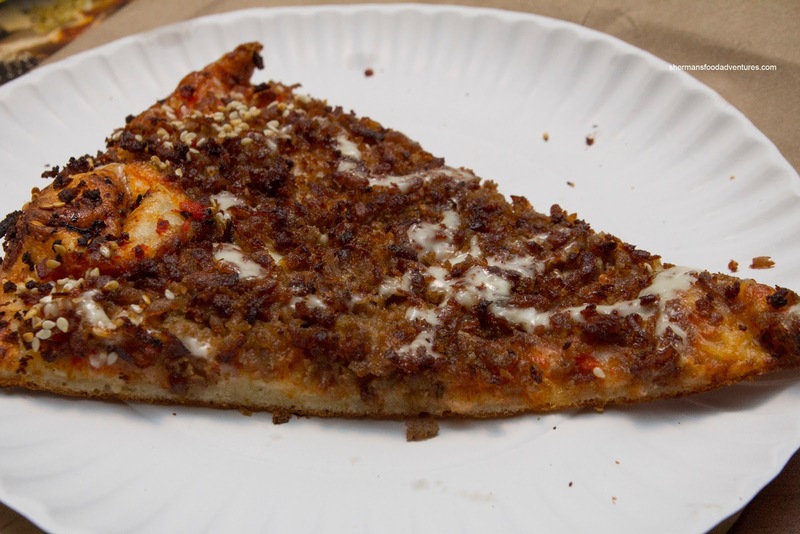 Although the crust was thin and crispy, it was noticeably less airy than Uncle Fatih's. To state whether it was better or not as good would be completely subjective. I can definitively say I liked the crust. As for the topping, it was very similar with bits of crispy beef and blue cheese dressing. I would've liked to see more dressing as it wasn't very impactful. I did like that the pizza was not salty at all. My next slice was the Capicollo and it did not disappoint in the spice department. Combined with the cheese and mild tomato sauce, it created a zesty concoction of flavours. 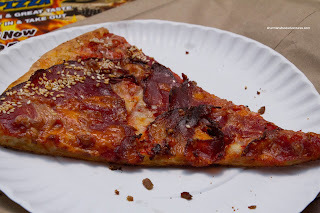 I liked how the entire slice was covered with meat. 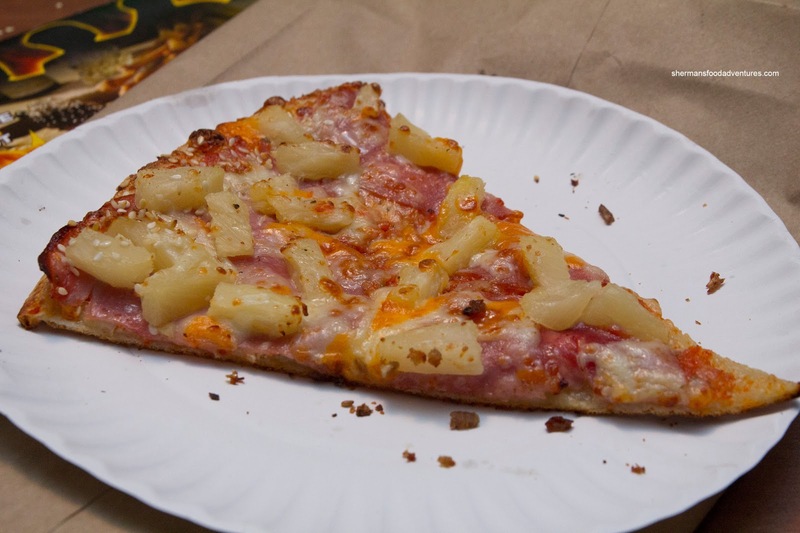 Lastly, I had the Ham & Pineapple which was pretty standard in taste. It did have lots of pineapple which added a good amount of sweetness. The ham was lean and completely covered the slice. I didn't really notice the tomato sauce very much, but then again, that wasn't necessarily a bad thing. 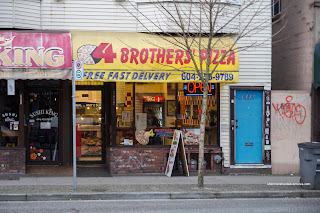 Hey, for 2 bucks a slice and open until 3:00am, 4 Brothers did the trick. I'd hit it up again for some slices when I'm all alone. Those brothers do have a mean beef and blue, but next time you're on the drive looking for pizza, you should give Mediterranean Fire a try. In my humble opinion, they currently hold the crown for best 2 dollar slice on the drive. Pizza slice supremacy on the Drive? Now there is a hotly debatable topic! For my money, it's got to be Pizza Garden, mainly because of their crust's superior flavour and texture (they use 00 Caputo flour, which really makes a difference). @Samm Cooper LOL. I went to Med Fire right after this. The post is in the queue! @Steve Yes, Pizza Garden is solid for sure.